much. And fresh details—even about well-known episodes in a candidate’s past—are much valued, at least by reporters and cable news viewers. 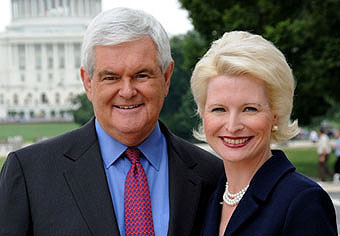 Thus, Gingrich may find it tough to escape the tawdry escapades of his earlier decades. Maybe! But here’s the thing: Gingrich may be a cannier media player than we think. Sure, he knows he’s going to get slammed for his sexual adventures, but he also knows that one of the iron laws of the news business is that no one is interested in “old news.” So the key to his success is to get in the race now, get all of these stories out in the open over the next few months, and then count on the media to yawn and refuse to bother itself over this stuff by the time serious campaigning starts later this year. In the end, I think David is probably right: Gingrich can’t escape his past. His primary opponents will stay quiet about his lecherous past as long as he’s no threat, but the minute he looks like he might really have a chance to win, at least a few of them will go after him with all guns blazing. Politics ain’t beanbag, after all.